Thinning is one of the most powerful forest management tools available to landowners. Thinning improves tree growth rates, species composition, disease and insect resistance, quality of wildlife habitat, forage production and visual appearance of tree stands. 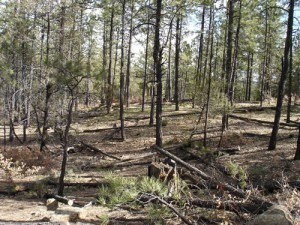 Thinning also increases a forest’s ability to survive wildfire. Thinning is removing selected trees from a stand to improve the growth rate or health of the remaining trees. As trees in a stand grow, they eventually occupy all the growing space, crowd out lower growing plants, and compete with each other. Unless some of the trees die or are removed, others cannot continue to grow. Thinning may be done to increase the resistance of the stand to environmental stress such as drought, insect infestation or extreme temperature. Native Earth Landscaping can help you create a defensible space perimeter by thinning trees and brush around your home and creating fire-safe zones with stone walls or patios.